Rigorously tested in the field, the Tornado BD 28/20 walk-behind scrubber is constructed with a tough roto-mold polyethylene body, ensuring years of maximum performance and reliability. Because of its quiet operation (only 67 dB), wide cleaning path and large capacity solution / recovery tanks, this unit is perfect for use in hospitals as well as grocery stores, retail facilities and warehouses. It lays down solution, scrubs, and recover that dirty solution in one pass. Leaves floor completely clean & dry! 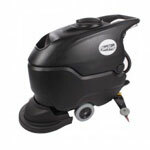 This machine can clean over 29,000 square feet per hour while increasing your building's occupant health and safety. Service down-time is significantly reduced with its wide-open clam shell design for fast and easy access to tanks, batteries and motor. When it comes to longevity, the Tornado BD 28/20 walk-behind scrubber will outlast the competition, and comes standard with a 10 year warranty on the body and tanks for years of hassle-free use and reliability. To remove build-up of water resistant soil, black heel marks, or heavy dirt deposits from your floor make sure you use a floor scrubbing soap like Trusted Clean's Super Concentrated Cleaning Solution or a floor scrubbing degreaser such as our Multi-Purpose Concentrated Degreaser. We recommend burnishing or polishing your floor with a high speed floor polisher machine and a product such as Brulin Shine Maintainer after scrubbing to polish your floors to a high shine. If you are looking for a machine with a smaller scrubbing width to clean hard to reach areas, take a look at our complete line of Tornado floor scrubbing machines which are part of our walk behind floor scrubbers category.